(1) Poetic Essays, 1767; (2) The Christian's Humble Plea, a Poem, in answer to Dr. Priestley against the Divinity of our Lord Jesus Christ, 1772; (3) Three hymns, in the Gospel Magazine, 1777; (4) The Death of Eumenio, a Divine Poem, 1779; (5) Another poem, suggested by the decease of a friend, The Reign of Death, 1780; and (6) Hymns adapted to the circumstances of Public Worship and Private Devotion, Leeds, G. Wright & Son. 1782. They are 166 in number, and were mostly composed to be sung after sermons by the author. 1. Behold the sin-atoning Lamb. Passiontide. No. 60 of his Hymns, 1782, in 7 stanzas of 4 lines. In several hymnals in Great Britain and America. 2. I my Ebenezer raise. Birthday. No. 102 of his Hymns, in 10 stanzas of 4 lines. Usually given in an abbreviated form. 3. Infinite excellence is Thine. Jesus the Desire of Nations. No. 42 of his Hymns, in 12 stanzas of 4 lines. In several hymn-books in Great Britain and America in an abridged form. 4. Jesus, the heavenly Lover, gave. Redemption in Christ. No. 10 of his Hymns, &c., 1782, in 7 stanzas of 4 lines, and headed, "The marriage between Christ and the Soul." In Snepp's Songs of Grace & Glory, 1872, it reads, “Jesus, the heavenly Bridegroom, gave," and stanza v. is omitted. 5. Lord, hast Thou made me know Thy ways? Perseverance. No. 122 of his Hymns, &c., 1782, in 8 stanza of 4 lines. In the Baptist Hymnal, 1879, No. 451, stanzas iv.-vii. are omitted. 6. 0 God, my Helper, ever near. New Year. No. 108 of his Hymns, &c., 1782, in 6 stanzas of 4 lines. The New Congregational Hymn Book, 1859-69 omits st. vi. 7. 0, my soul, what means this sadness? Sorrow turned to Joy. No. 111 of his Hymns, &c., 1782, in 5 stanzas of 6 lines, and based upon the words, "Why art Thou cast down, O my soul?" &c. It is in common use in America, and usually with the omission of stanza ii. as in Dr. Hatfield's Church Hymn Book, 1872. 8. Sinners, the voice of God regard. Invitation to Repentance. No. 63 of his Hymns, &c., 1782, in 7 stanzas of 4 lines on Isaiah lv. 7, "Let the wicked forsake his way," &c. It is in common use in America, but usually in an abbreviated form. 9. Thy presence, gracious God, afford. Before Sermon. No 165 in his Hymns, &c., in 4 stanzas of 4 lines, and a chorus of two lines. In Dr. Hatfield's Church Hymnbook, 1872, No. 126, the chorus is omitted. Fawcett has another hymn on the same subject (No. 79) and beginning, "Thy blessing, gracious God, afford," but this is not in common use. 10. Thy way, 0 God, is in the sea. Imperfect Knowledge of God. No. 66 in his Hymns, &c., 1782, in 7 stanzas of 4 lines on 1 Corinthians xiii. 9, "We know in part," &c. It is in several American collections, usually abbreviated, and sometimes as, "Thy way, O Lord, is in the sea." In this form it is in The Sabbath Hymn Book, 1858, &c.
11. With humble heart and tongue. Prayer for Guidance in Youth. No. 86 in his Hymns, &c., 1782, in 7 stanzas of 4 lines on Psalms cxix. 9. "Wherewith shall a young man cleanse his way." It is No. 954 in the Baptist Psalms and Hymns, 1858-80. About 20 of Fawcett's hymns are thus still in common use. Two hymns which have been ascribed to him from time to time, but concerning which there are some doubts, are fully annotated under their respective first lines. These are," Humble souls that seek salvation," and "Lord, dismiss us with Thy blessing." 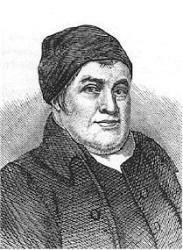 John Fawcett (6 January 1739 – 25 July 1817) was a British-born Baptist theologian, pastor and hymn writer.